Red Willow Vineyard Archives - Write for Wine: It's Wine O'Clock Somewhere!Write for Wine: It's Wine O'Clock Somewhere! 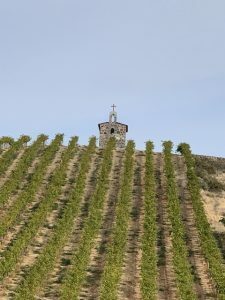 We recently stopped by Red Willow Vineyard in the Yakima Valley and spent an incredible afternoon with the Sauer family, Washington wine royalty. As mentioned in our previous post, one of the highlights of our visit was learning about Mike Sauer’s clone program, which he started with Master of Wine David Lake in 2005. The two Washington wine legends experimented with different cuttings certified from UC Davis Viticulture and Enology. Their clone program continues today. 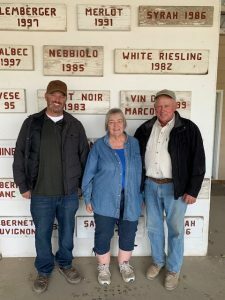 Last week, we had the honor of visiting Red Willow Vineyard and spending an afternoon with the incredible Sauer family, Washington wine royalty. We toured part of the vineyard with Mike, Karen and their son, Jon, and later were joined by Jon’s wonderful wife Kelly and their five lovely children. In this photo, (from left) Jon, Karen and Mike stand in front of old signs of grapes planted at Red Willow. Of note, the sign for the 1986 Syrah represents the first grape planted in Washington state. During our visit, Mike told us about the harvest, which was almost but not quite over. He also discussed his clone project, and we tasted three wines made from some of those clones. Although we spent time with Mike and Karen at a wine event in 2017, we hadn’t been to Red Willow in nine years. It was an amazing experience. Whether you live in nearby British Columbia or in the Seattle area, mark your calendars for April 28-30 — a wonderful weekend for wine lovers. 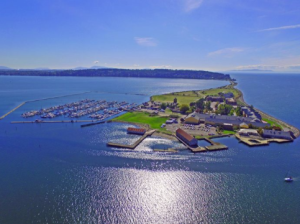 We have tasted wines from all of the attending wineries and vineyards, and we also attended last year’s inaugural Northwest Wine Encounter — so we can personally attest to the experiences awaiting you this year at Semiahmoo Resort. The weekend event is packed with educational and fun times, opening on Friday, April 28 with a Winemaker’s Reception, followed by a private beach bonfire with gourmet s’mores paired with port. Here is the list of activities to enjoy at the scenic, breathtakingly beautiful resort. You can also download the full schedule at Semiahmoo’s website. Enjoy a casual tasting, hearty appetizers by Bruno Feldeisen, executive chef at Semiahmoo Resort’s Pierside Kitchen, and the opportunity to mingle with the winemakers and wine experts. Enjoy s’mores and mingling for Northwest Wine Encounter guests and winemakers. A port tasting with exquisite gourmet chocolates from jcoco enhance this signature NWWE experience (weather dependent). A look at Northwest wine country and an overview of the wines you will taste over the next two days, hosted by Andy Perdue of Wine Press Northwest, who is also a wine columnist for The Seattle Times, as well as retailer and collector Doug Charles of Compass Wines. Explore Pinot Noir with Chris Figgins, Tony Rynders and Walter Gehringer. One of the most famous wine towns in North America is Walla Walla. What makes the region so special? Explore this AVA with David Merfeld and Chris Figgins. In this fun format, each participant will get the opportunity to taste wine one-on-one with our winery panelists. Get up close and personal with winemakers and top experts at this Winemaker Gala Dinner. Each table is hosted by a panelist or wine industry luminary, and a five-course meal will be crafted by Chef Bruno Feldeisen and celebrity chef Roy Breiman of Coastal Hotels. The courses will be paired by wines from all wineries in attendance. How important is a single vineyard? A single location within that vineyard? These questions will be explored with Chris Upchurch along with historic grower Mike Sauer. The entire weekend package — including two nights at the gorgeous resort — starts at $475 per person. Further information is available at Semiahmoo Resort’s website.